Tonight is the most romantic night of the year. Are you looking for the perfect stylish and elegant outfit? Try this gorgeous MANGO strapless dress with Metallic ankle cuff Platform Heels. 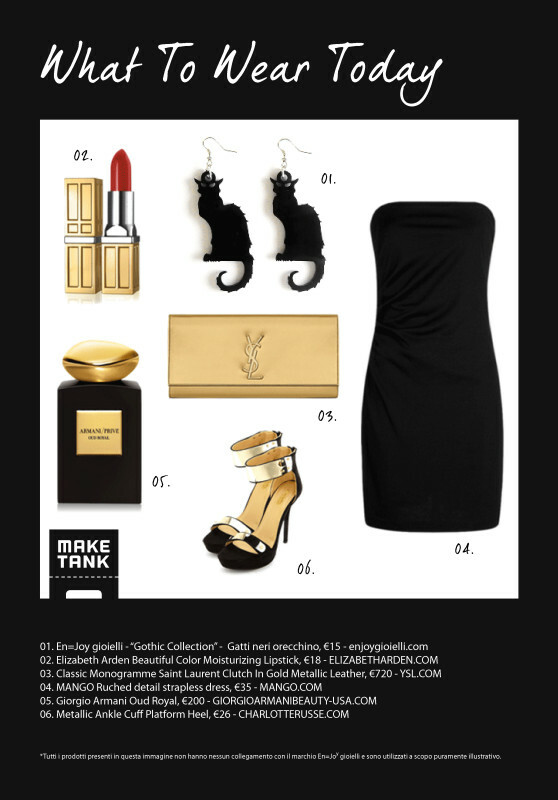 Accessorize with En=Joy Black cat earrings (you find them here for only 15€) and a classic monogramed Saint Laurent gold leather Clutch. To tie it all together add a touch of Elizabeth Arden moisturizing red Lipstick and a splash of Giorgio Armani Oud Royal (available only in the USA). You’re ready to go dancing all night long! Thanx to En=joy for the gorgeous outfit!